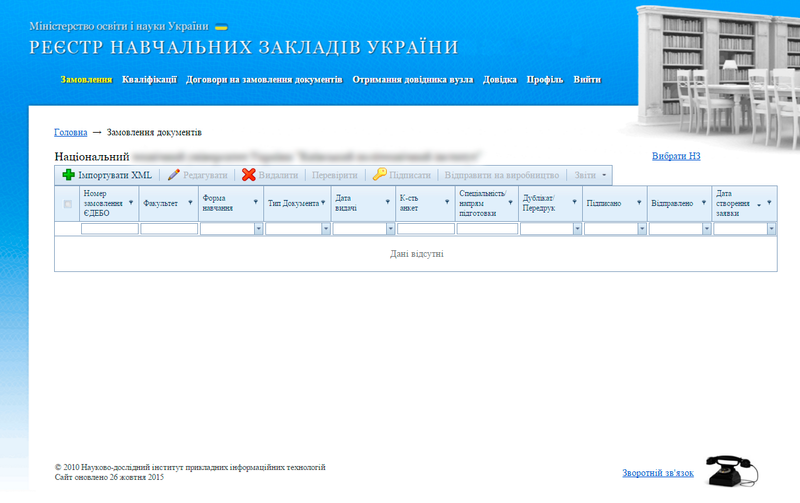 On the website Register of educational institutions of Ukraine http://dodatok.osvita.net/ realized the ability to create orders for production of documents on education and student/pupils tickets XML-based files exported from YEDEBO. In cabinet of educational institution in section “Order”, you can import XML-files received in YEDEBO, check and sign print application and supporting documents. After signing paper confirmations head once you click one button to send a request to the operator receiving data production system. Built-in checks will help you to create correct entries. All applications will be kept in your cabinet on the site and it will save you from installing software to collect data on your PC, update them and other operations on the database accompaniment. For work you need card of administrator / operator node to which you connect the program Education.